Strikedeck’s out-of-the-box algorithms calculate a health score for each customer based on the factors prioritized, helping to identify key customers and cohorts, and track status changes in real-time. The health algorithm can be customized, allowing clients to select the scoring parameters and weightages to incorporate into the formula. Strikedeck’s CS offering brings in data from any external platform to form into a single, unified system of record for each and every customer. One-click integrations with Salesforce, Zendesk, Jira, Desk, Marketo, Freshdesk, Act-On, and many others remove the burden of facilitating consolidations in-house. Strikedeck simplifies customer data collection, while seamlessly blending with your product so that you can utilize inline support, knowledge base, and help features. Strikedeck’s engineering team also builds custom integrations so that any data source can become compatible with the platform. Simple, visual, and powerful workflows allow you to segment customers and take action with tailored campaigns across your user base. Daily operations are streamlined with automated tasks, playbooks, and outreach triggers. Create and share reports that increase renewals, accelerate upgrades, and keep tabs on customer satisfaction. Strikedeck’s powerful segmentation tool allows CS professionals to group customers into specific buckets by choosing combinations of filters related to profitability, geography, vertical, success potential, product usage, and much more. This capability enables CS to tailor their approach for subsections of their customer base, deliver more value to customers, prioritize particular cohorts, and personalize outreach. Strikedeck automates the biggest pain point in Customer Success, aggregating data, calculating value, and formatting reports for customers. With Strikedeck, reports can be automatically generated into Word, Powerpoint, and PDF formats, and personalized with specific customer data. Each report can be customized, and delivered directly to the customer via automated workflows. Strikedeck provides the ability for Customer Success teams to communicate with customers in three ways – via emails, surveys, and in-app notifications. Strikedeck’s communication platform’s true power is in enabling personalization and hyper-targeting based on the customer data gathered from different data sources like CRM, communication feedback, and product usage trackers. A 200+ page comprehensive resource for any professional looking to transition into Customer Success, or get a refresher in all the essentials of the field. The Beginner’s Guide to Customer Success takes you through how CS evolved; how to get started in CS including hiring and interview tips; a complete glossary of all the relevant jargon; strategy tips for onboarding, journey maps, QBRs, and more; how to approach CS platforms and automation; tips for collaborating with other departments including Sales, Product, Engineering, and others; a business booklist; team-building exercises at the end of each chapter, and much more! Also Check Out Our FREE eBooks! 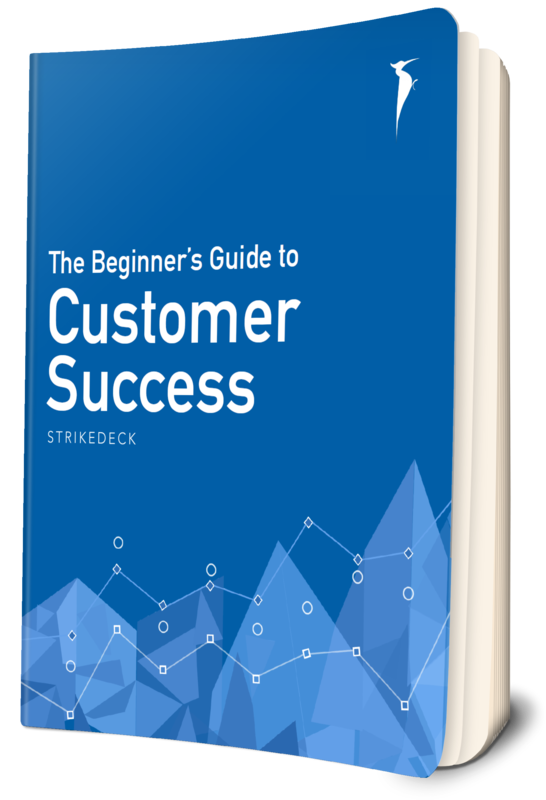 Get the inside scoop on Customer Success from CS leaders! Get 21 great email templates designed to increase engagement! Get 10 easy tips for upgrading your entire onboarding process! Experience Strikedeck in action. See how easy it is to engage with your customers, deliver an outstanding customer experience, and maximize the value of your customer relationships.